There’s a lot to love about those nine crazy months leading up to baby’s arrival, but there are definitely a few defining moments that you will forever hold in your heart. For me, the first one was when I looked down and saw two pink lines. The next one happened on the day that we got our first glimpse of baby at our ultrasound. And if you’re like me and you can’t wait until baby is born to know if you’re having a boy or a girl, the moment that you find out if you’ll be buying bow ties or tutus will absolutely take your breath away. 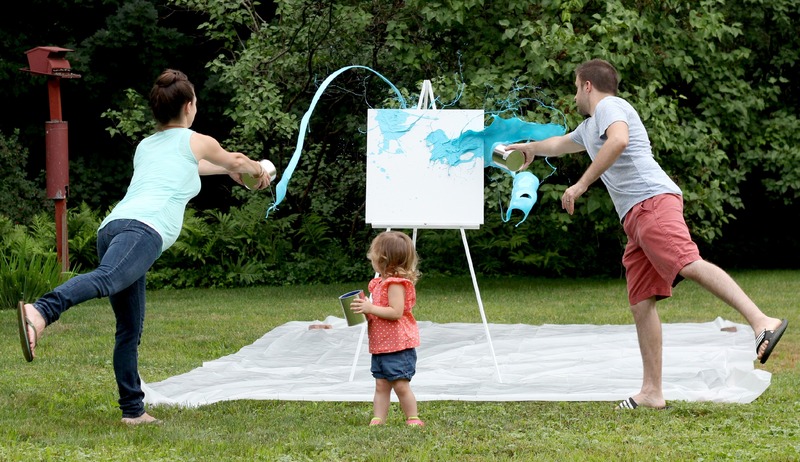 We decided to share our news with our family and friends with an artistic gender reveal. We took a little inspiration from Jackson Pollock, and with a few empty paint cans, three bottles of acrylic paint and a blank canvas, our secret was out. The best part about our artistic gender reveal is that now we have a one-of-a-kind piece of art to hang in baby’s nursery! I’m thinking about adding a favorite quote or maybe even baby’s name (still TBD, by the way) to the canvas. What do you think? How did you reveal your baby’s gender to your family and friends? It’s definitely a moment to celebrate, and I’d love to hear your story!